No caps lock light on your keyboard? Some of the new Microsoft keyboards do not have a caps lock light which can be annoying as hell but there are a couple of easy to apply workarounds. Enable a caps lock sound. 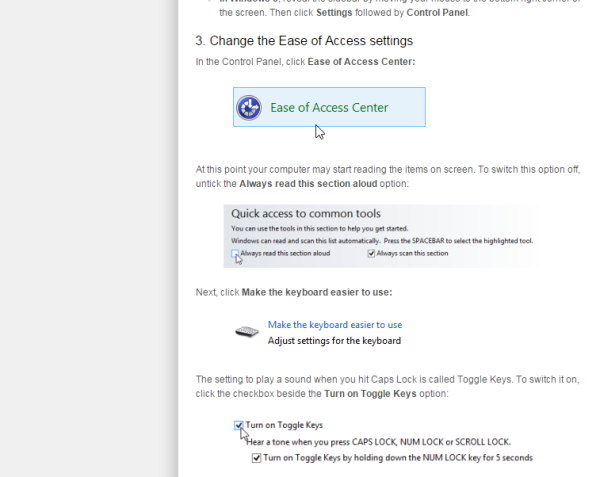 in the Ease of Access center you will find the toggle switch to enable caps lock sound. In Windows 10 or Windows 7 and Windows 8�type “ease” without the quotes�into the search box in the lower left of the desktop. You can turn off “always read this section aloud” before continuing. Scroll down to “turn on toggle keys” and also select turn on toggle keys by holding down the num lock for 5 secs. Click apply, then ok and close the remaining window. Now you have caps lock sound enabled. You can toggle off and on using the num lock key for 5 seconds. 2. If you prefer a visual display for caps lock go the Microsoft Keyboard Center, down the 32 or 64 bit bit version of the Keyboard software. It’s a free download and will display a caps lock pop up in the lower right hand side of the desktop. You are currently browsing the Wired Office weblog archives for November, 2015.